Behind every assassination, there is an anonymous mastermind—a plotter—working in the shadows. 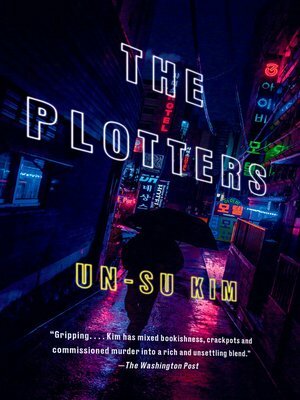 Plotters quietly dictate the moves of the city's most dangerous criminals, but their existence is little more than legend. Just who are the plotters? And more important, what do they want? Reseng is an assassin. Raised by a cantankerous killer named Old Raccoon in the crime headquarters "The Library," Reseng never questioned anything: where to go, who to kill, or why his home was filled with books that no one ever read. But one day, Reseng steps out of line on a job, toppling a set of carefully calibrated plans. And when he uncovers an extraordinary scheme set into motion by an eccentric trio of young women—a convenience store clerk, her wheelchair-bound sister, and a cross-eyed librarian—Reseng will have to decide if he will remain a pawn or finally take control of the plot.